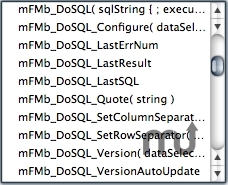 Use SQL statements to select/update/create/delete FileMaker records. Is there a better alternative to DoSQL? Is DoSQL really the best app in Libraries category? Will DoSQL work good on macOS 10.13.4? DoSQL is a FileMaker Pro plug-in for Windows and Mac that allows you to to manipulate FileMaker data from FileMaker calculations. The plug-in uses SQL statements to select, update, create or delete FileMaker records. keep a change log of your records, add rollback functionality, audit trails, etc. Execute queries with parameters, to prevent SQL injection. DoSQL needs a review. Be the first to review this app and get the discussion started! DoSQL needs a rating. Be the first to rate this app and get the discussion started!